In Part 1 of our report on the Alitalia Group’s 2013-2016 Industrial Plan, we considered the first two of four strategies identified: the redefinition of the roles of Alitalia and Air One on short/medium haul and the expansion of its intercontinental activities. In Part 2, we attempt to assess its objectives around the other two elements of the Plan, on which it has given fewer details. These two areas are collaboration with infrastructure partners (including a focus on intermodal connections with high speed rail) and the development of its MilleMiglia loyalty programme. In identifying high speed rail and the opportunities presented by better exploitation of its FFP as strategic priorities, Alitalia has shown some innovative thinking. However, its profit targets to 2016 are far from ambitious and the Plan needs reinforcement if it is to become the much needed catalyst to provoke more radical change that is necessary to restore Alitalia’s competitiveness. By contrast with the first two strategies (the redefinition of the roles of Alitalia and Air One on short/medium-haul and the development of intercontinental activities), Alitalia’s press release of 3-Jul-2013 gives little space to presenting its third strategy. It refers to “the identification of new partnerships and the strengthening of existing ones with key infrastructure partners in Italy, such as, for example, airports”. It adds that the goal is to create synergies and improve customer satisfaction through increased efficiency of ground operations, joint development of network and infrastructures and the expansion of services which are not closely related to flight operations (parking or transfers to/from airports). Much of this sounds like what most airlines are trying to do most of the time: generate cost savings and enhance the passenger’s experience through the airport. The element in Alitalia’s third strategy of the 2013-2016 Plan that is a little different is the call for collaboration between aviation and high speed rail. Alitalia’s plan seeks opportunities to develop intermodal connections, leading to a “more efficient allocation of traffic between train and plane”. High speed rail is an important topic for Alitalia, given the weighting of its network towards domestic operations, and provides it with both a threat and an opportunity. Only two of Air One’s top ten domestic routes by number of seats have both ends of the route on the Italian mainland, namely Venice to Naples and Bari to Milan Linate. The duration of equivalent rail journeys, a minimum of five hours and seven hours respectively, mean that rail is not an effective substitute. The remaining eight routes link cities in the mainland with destinations in the islands of Sicily and Sardinia and so are not vulnerable to high speed rail competition. By contrast, eight of Alitalia’s top ten domestic routes are mainland to mainland, with only two connecting the mainland with Sicily. Of the eight, the Rome Fiumicino-Milan Linate and Rome Fiumicino-Milan Malpensa routes are the most substitutable by high speed rail. The journey between Rome and Milan takes around three to three and a half hours from city centre to city centre and there are 19 non-stop daily services. Milan Malpensa airport is connected directly to the high speed rail network. The rail journeys on the remaining six mainland to mainland routes are probably beyond the duration that makes them superior substitutes for the air route, with the possible exception of Rome-Venice. Currently, Rome-Venice takes three hours and 45 minutes by train; Rome-Lamezia Terme a minimum of four hours; Rome-Bari around four hours; Rome-Turin four hours or more; Rome-Genoa four hours and 15 minutes or more; and Rome-Brindisi around five hours. While high speed rail is not a major threat to Alitalia and Air One on most of their top domestic routes, the Italian rail network is well developed and journey times are likely to decrease in the future. This may increase the number of air trips that can be conveniently substituted by rail. In the meantime, the high speed rail terminal at Milan Malpensa Airport provides an opportunity to bring increased feed into Alitalia’s international network. Indeed, commercial logic favours the use of a slot to serve an international or intercontinental destination over its use for a domestic destination, assuming that domestic feed can be maintained. If, as seems likely, a growing number of domestic passengers shift from air to rail, it makes sense for Alitalia to develop partnerships with rail operators. The purpose of such relationships should be to maintain a relationship with these passengers and to facilitate their transfer onto the international air network. Collaboration between air and rail loyalty schemes should form part of these agreements. Alitalia Loyalty is a new subsidiary company of the Group, formed in late 2012, dedicated to the development of Alitalia’s MilleMiglia frequent flyer programme. Under the Group’s 2013-2016 Plan, Alitalia aims to enhance the programme in a number of ways. These are by growing the scheme’s membership, developing new ways to redeem miles on flights and other services, creating partnerships with banks and credit card companies, collaborating with a “coalition of many loyalty programmes” in order to increase opportunities to earn and redeem Alitalia miles, and improving communication with MilleMiglia members. At this stage, Alitalia has not given additional details of how it will achieve these aims, but some changes to the MilleMiglia scheme are already evident since the start of 2013. These include a higher rate of earning miles on flights between Rome and Milan, presumably in an effort to combat new competitor easyJet as well as high speed rail on this route. In addition, it is now easier to access and retain Exclusive Club status within the programme (from the basic MilleMiglia membership, there are three further tiers of ‘Exclusive Clubs’: Ulisse, Freccia Alata and Freccia Alata Plus). In addition to earning miles with Alitalia, Air One and Skyteam partner airlines, MilleMiglia members can already earn miles with credit card, car hire, hotel and other commercial partners. Currently, miles can be redeemed for awards and upgrades with Alitalia and partner airlines or to make charitable donations. Opportunities to redeem miles with partners in other commercial sectors are currently very limited. The 2013-2016 Plan implies that Alitalia will add to its MilleMiglia partners and broaden the currency of its loyalty scheme by giving members more ways both to earn and spend their miles. The experience of other carriers shows that setting up the FFP as an autonomous unit and allowing it to develop partnerships with retailers and other consumer businesses outside the aviation sector, often on a reciprocal basis with other loyalty schemes, can lead to it becoming a significant revenue generator. Alitalia is taking its first steps in this direction. Its use of language does not always follow financial convention (this may be the fault of its translators) and so we have had to make our own interpretation of these objectives. In addition to these profit targets, Alitalia plans to increase the convertible loan from shareholders by EUR55 million and to increase financial resources by EUR300 million by Dec-2013 (presumably through increased debt or asset disposals). Alitalia has not made a profit since the new company came into existence in 2009. The Group’s 2012 net loss of EUR280 million, after a loss of EUR69 million in 2011, brought its cumulative net loss to EUR843 million since 2009. In 1Q2013, its net loss widened to EUR157 million from EUR131 million in the first quarter of 2012. The Group’s operating loss was EUR119 million in 2012, a deterioration of EUR113 million versus 2011, and the 1Q2013 operating loss was EUR136 million, a deterioration of EUR27 million versus 1Q2012. Its target to achieve a positive EBIT (operating result) in 2H2013 compares with a positive result of EUR50 million in 2H2012. Although year on year trends have been declining, this target is loose enough to be achievable. The remaining profit targets also look achievable, but are not very ambitious. Between 2009 and 2011, Alitalia cut its operating (EBIT) loss by EUR268 million and its net loss by EUR257 million. In order to achieve EBIT break-even in 2014, it will need an improvement in EBIT of EUR119 million over the two years from 2012 to 2014. Its 2015 net profit break-even target requires a three year improvement of EUR280 million. If achieved, it will still have recorded six years of net losses (2009 to 2014). Net debt grew steadily from 2009 to 2012, when it reached more than EUR1.0 billion (growing by EUR174 million through 2012). Alitalia’s liquidity position deteriorated to only EUR75 million at the end of 2012 (from EUR326 million at the end of 2011). Alitalia proposed in Feb-2013 that its shareholders subscribe to a loan of up to EUR150 million, in proportion to their shareholdings. The loan is convertible into shares after one year and up to 2015 (when the loan will automatically convert into shares). Shareholders representing 12% of the total voted against the proposal, suggesting that a maximum of EUR132 million was raised. At the end of 1Q2013, liquidity had improved from EUR75 million in Dec-2012 to EUR159 million. However, this is still equivalent to only a little more than two weeks of revenues and suggests that a significant chunk of the convertible loan funds had already been consumed. It seems likely that the additional EUR55 million now requested from shareholders will go towards funding working capital this year. Alitalia does not say how it intends to achieve the additional aim in the Plan to increase financial resources by EUR300 million in Dec-2013. This could only really be done either by increasing debt, or by asset sales, but neither of these options seems straightforward. Given already high levels of debt, it seems unlikely that it could raise EUR300 million through additional debt. Since its aircraft are mainly leased, it also seems unlikely that it could raise such a sum through sale and lease back of owned aircraft. Perhaps it has other assets that could be sold, but, as a privately-owned company, its financial disclosure is limited and so it is not clear what these assets might be. Perhaps a partial sale of Alitalia Loyalty is planned? This is a classic case of ‘watch this space’, but it is possible that a combination of higher debt, aircraft sales and the disposal or partial disposal of other assets is envisaged by Alitalia. 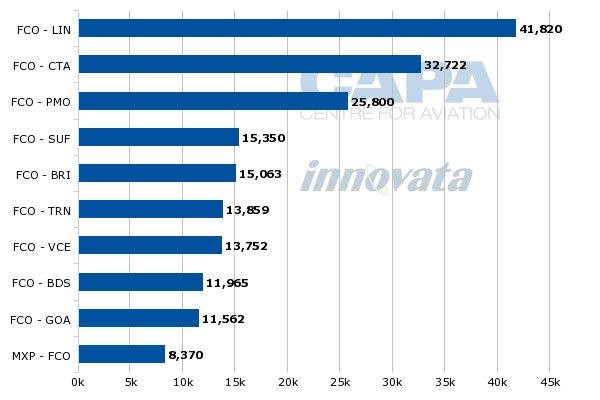 “… an analysis of Alitalia’s cost per passenger and average sector length against those of other European carriers shows that its cost base is quite competitive against other full service carriers (see chart below). Given an average sector length at the low end of the scale for FSCs, its cost per passenger is also at the low end of the scale and actually below the line of best fit for FSCs. It seems that Alitalia’s 2013-2016 Plan signals an intention to move itself up the curve, with an increased emphasis on international and intercontinental operations. However, as noted in Part 1 of our report, Alitalia’s long-haul operations will still look sub-scale compared with the major European long-haul operators. 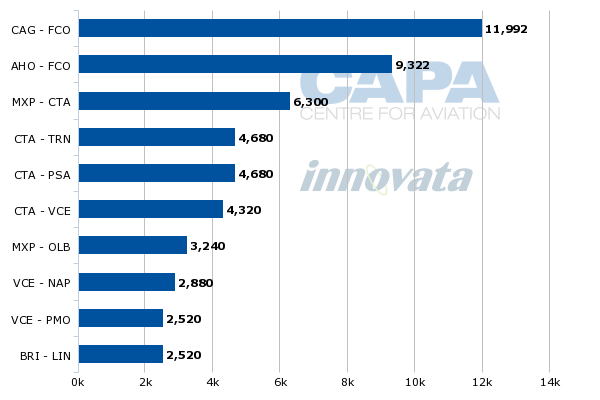 Moreover, its European international expansion will take it into more direct competition with the LCCs. It may be possible for the Alitalia Group to realise some revenue enhancement by growing and raising the profile of its loyalty programme. There may also be some cost efficiencies to be gained from partnerships with infrastructure providers and the more focused differentiation between the activities of Alitalia and Air One. There may also be further details of Alitalia’s industrial strategy that it has not disclosed and which could have a more significant impact. Based on what has been announced, however, the 2013-2016 Plan appears to need other features if the expectation is fundamentally to alter its competitive positioning or its cost base and lead to sustainable profitability. *Financial year ends as follows: LOT Dec-2011; Pegasus Airlines, Air Berlin, Turkish Airlines, Lufthansa, Austrian, SWISS, Aer Lingus, IAG, Air France-KLM, Finnair, Norwegian, Pegasus, Vueling Dec-2012; Monarch, SAS Oct-2012; easyJet Sep-2012; Wizz Air, Ryanair Mar-2012, Virgin Atlantic Feb-2012.